This volume explores the preventive war option in American foreign policy, from the early Cold War strategic problems created by the growth of Soviet and Chinese power, to the post-Cold War fears of a nuclear-armed North Korea, Iraq and Iran. For several decades after the Second World War, American politicians and citizens shared the belief that a war launched in the absence of a truly imminent threat or in response to another's attack was raw aggression. Preventive war was seen as contrary to the American character and its traditions, a violation of deeply held normative beliefs about the conditions that justify the use of military force. This `anti-preventive war norm' had a decisive restraining effect on how the US faced the shifting threat in this period. But by the early 1990s the Clinton administration considered the preventive war option against North Korea and the Bush administration launched a preventive war against Iraq without a trace of the anti-preventive war norm that was central to the security ethos of an earlier era. 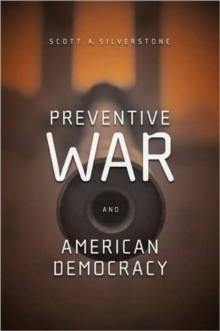 While avoiding the sharp partisan and ideological tone of much of the recent discussion of preventive war, Preventive War and American Democracy explains this change in beliefs and explores its implications for the future of American foreign policy.